Nobody Broils dinner anymore. Most people like to grill. When trying to prepare a broiled dish at home using a residential stove broiler can produce less than desirable results. A typical 30″ Gas range has a better searing effect than many electric ranges. When you cook with many of todays luxury brand wall ovens and dual fuel electric ovens, the broiler has multi-pass element that provide an excellent high heat. When I worked in a restaurant during high school several of the items on the menu were broiled. We had shish kebob, shaslik, broiled haddock, shrimp, scrod, scallop…typical New England fair, you get the point. Many restaurants are successful with these dishes because they are flavorful and perceived ‘healthy’ since it’s not fried in oil. But… most restaurants add a lot of butter during the cooking process. 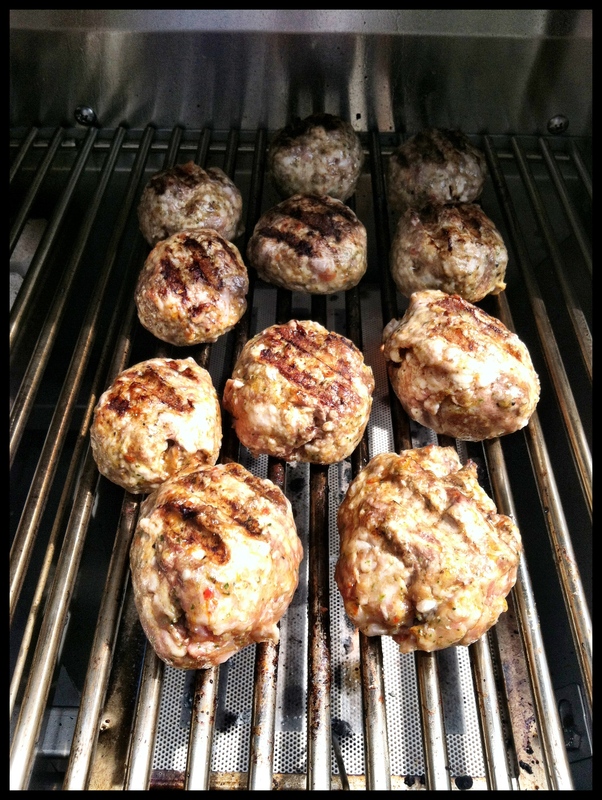 A commercial broiler which is typically gas powered, has a high that provides searing that is better than most grills. Since it does not flare up you don’t get the noted carcinogens associated with grilling over an open flame that produces Heterocyclic Amines (Certainly more studies have to be done to all types of cooking methods using high heat and searing proteins in the process). How can you prepare a broiled dish without all the added fats? The Gaggenau Combi-Steam oven has a Broil feature called Grill with Humidity that incorporates moisture with heat from a infrared broiler under glass. 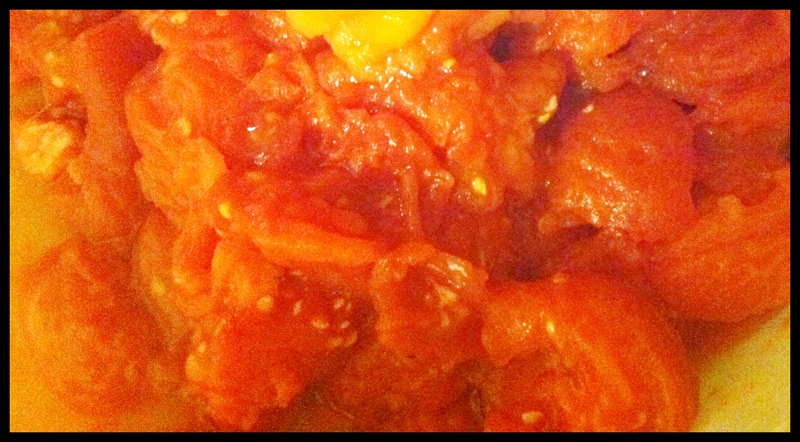 This dish is a simple preparation of Salmon Steaks with prepared Kimchi showcases the ease of cooking with this method. The purpose is to show how fast and easy it is to broil although please understand positioning of the pan for even cooking. 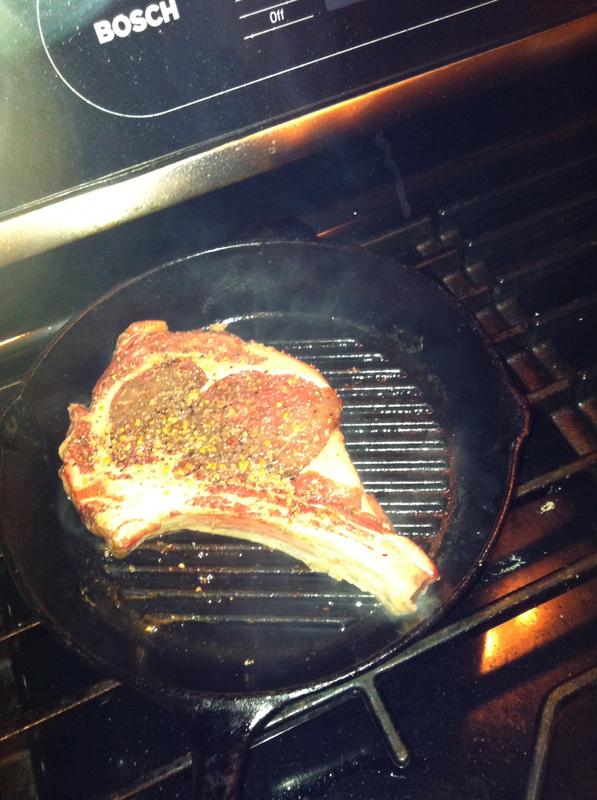 I placed the pan into the oven during the heating process to provide a sear to the steak when placed on the rack. Be careful when remove the hot pan from the oven and place on your stove top with the vent hood on. Slowly add some hot water to the pan to loosen up any burnt on dripping. Food would have that appearance if you are poaching in Steam Mode but when you combine with Convection, the oven temperature is set high enough to Brown the food that you are cooking. The bursts of steam help retain moisture to the food so that it doesn’t loose as much volume as when traditionally cooking in a Dry Heat Oven. The increase of humidity in the oven also helps speed up the cooking time. I recommend keeping your temperature the same as the recipe but reduce the time by 25-30%. Remember to cut your vegetables in similar sizes, although softer vegetables should be cut larger than dense ones to produce even results. If softer vegetables are cooking too much, add a bit of vegetable stock or wine to the pan. 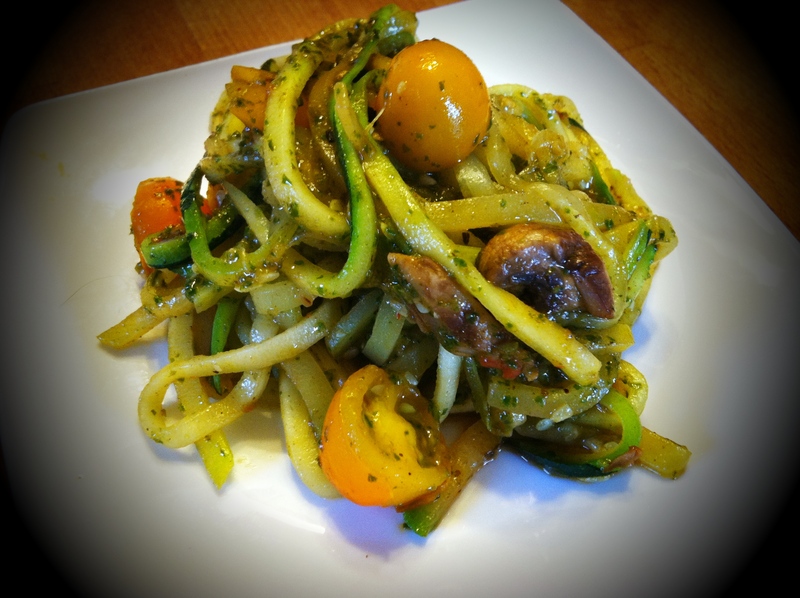 In this recipe I cooked the vegetables on the pan that came with the Steam Oven. You can also cook on a pan on the rack set into the oven. Metal will produce different results than Glass cookware. If you have a 1/4 size sheet pan that is thick such as a USA Pan, the pan helps produce nice browning and crispiness. Also, it won’t bend like an aluminum pan and cleans up very easily. When the tomatoes start turning from green to red, it’s time to go and NOT STOP. The basket fills up, friends and family don’t want anymore. Perhaps you can set up a table at the end of your driveway and sell some. 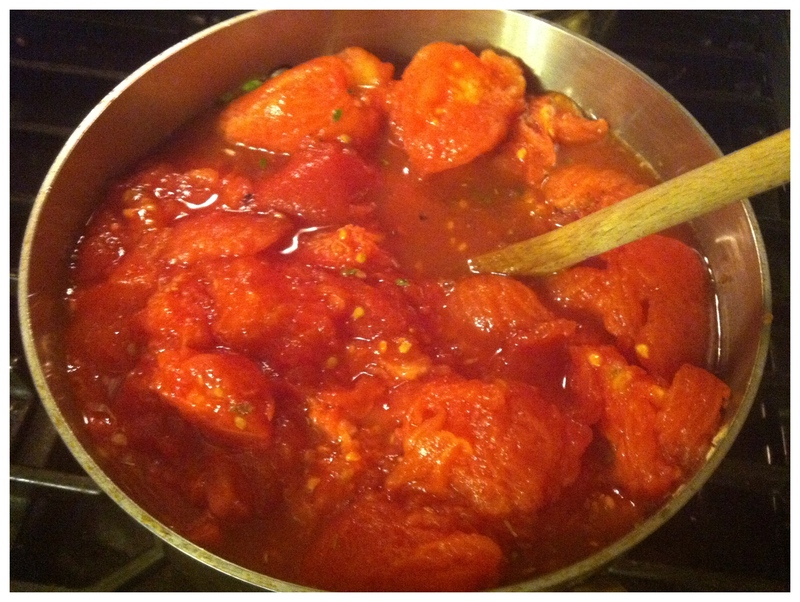 Set a large pot of water on the stove to blanch the tomatoes. Set up another pot or container with a cold water bath to shock the tomatoes. Let the tomatoes boil to the point that the skins begin to peel away then immediately place tomatoes in the cold water. Peel & Seed the tomatoes. Simply put, pull away the skins and break the tomatoes by hand and squeeze out the seeds. 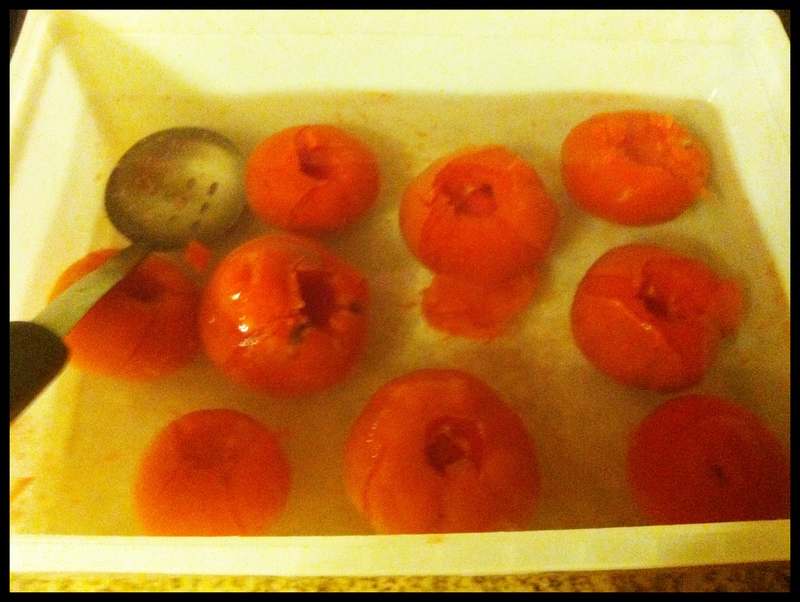 Retaining the pulp of the tomato. 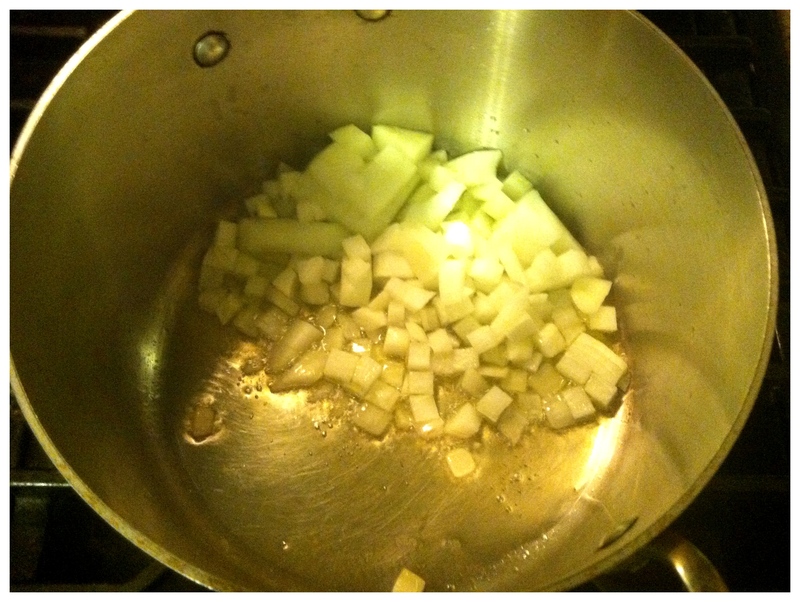 In another large pot or saucepan, heat over a medium heat, add the oil. Add the onion and cook to translucent. Add the garlic, oregano & red pepper seed and cook for a minute. 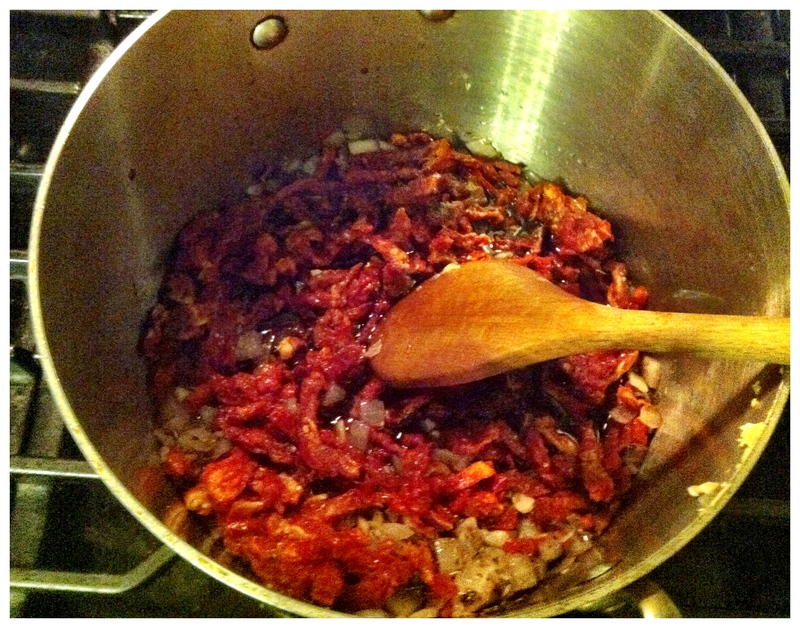 Add the sun-dried tomatoes and water. Cook to reduce the water in half. Add the fresh tomatoes. Heat over a high heat for about 8 minutes then reduce to a low simmer. Add the thyme. 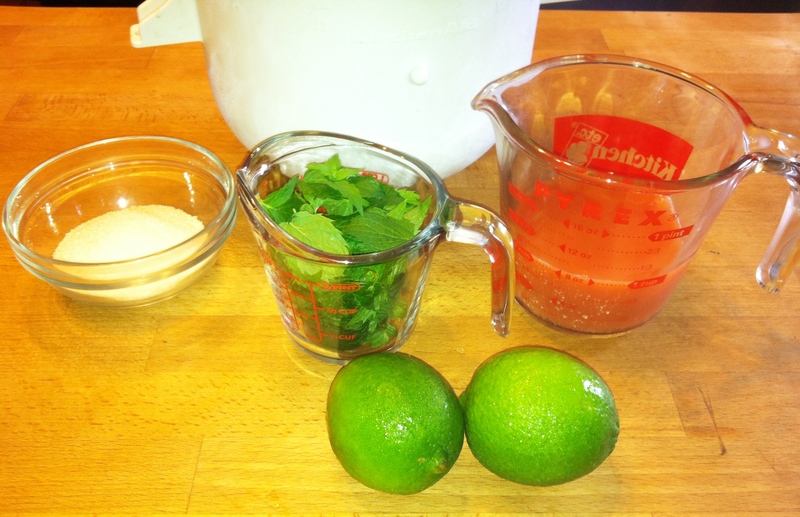 Using a hand blender or food processor, blend to smooth. Season with salt. Pack it up and freeze it, eat it, sell it or give away as a gift. This recipe can be used for a variety of fish or chicken. If you are gluten-free, substitute the AP flour with tapioca, rice, or corn flour. This should feed 4 people. 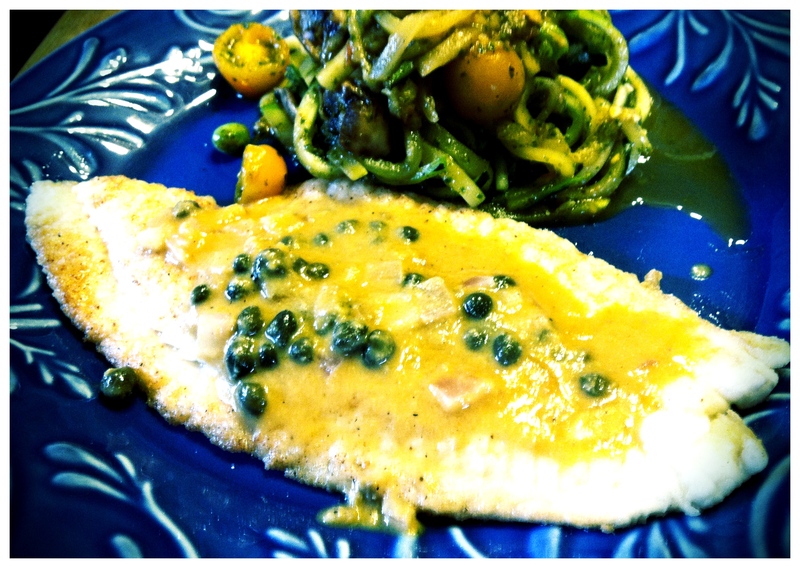 Sole or flounder fillets are small so pick the largest ones you can get or select two per person. Set some paper towel over a bake pan or large platter. Turn on your vent hood. Set a large saute pan over a medium to high heat. Season the fish with salt & pepper, then dust both sides with flour. Add the oil to the pan. Turn the pan to coat. Carefully place the fillets on the bottom of the pan. Don’t touch them. After three minutes, the flour around the edges of the fish begins to turn brown,turn the fish over and shut the heat off. Let them continue cook from the heat of the pan for about two minutes then transfer to a paper towel lined platter. Return pan to stove and set over a high heat. 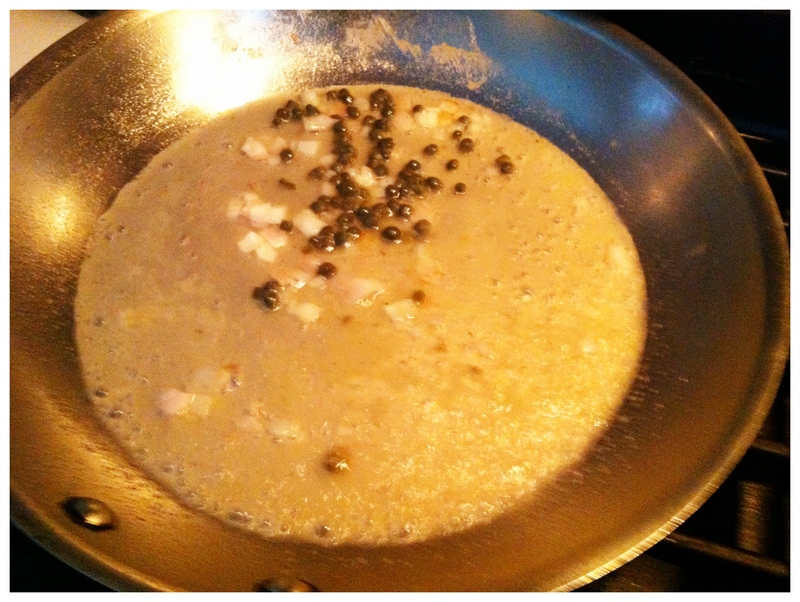 Add the shallots, lemon juice, white wine and capers. 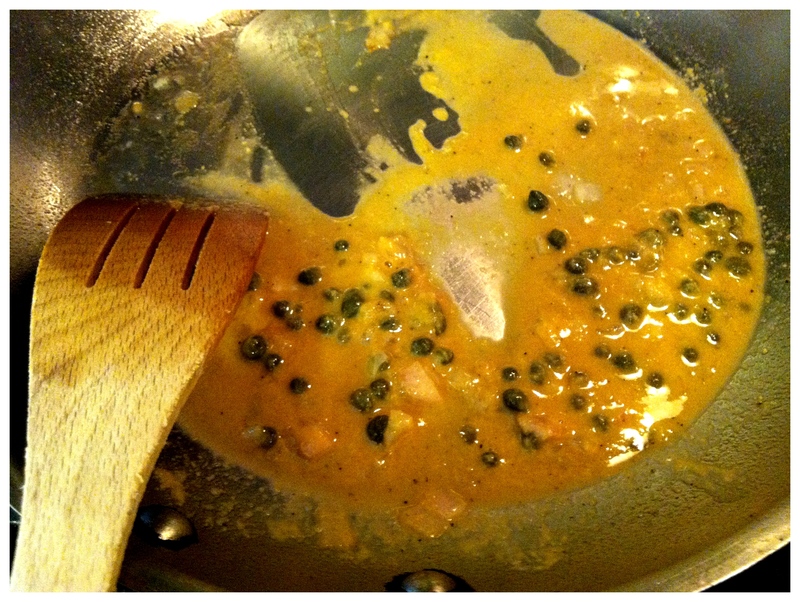 Let the liquid reduce in half then stir in Dijon. Season with a pinch of salt. Plate the fish and cover with sauce, garnish with fresh thyme. I needed a fruit and lettuce combo that has some pizzazz. The presentation is up to you. 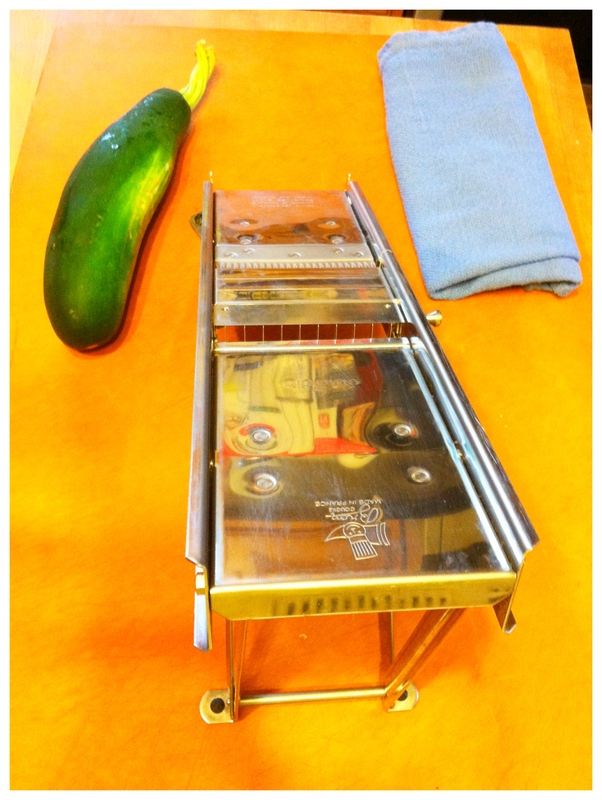 Certainly you don’t have to go through the effort of using a Mandoline for slicing. This salad could be combined in a bowl with the dressing on the side. Either individually plate the above or display in a large serving bowl. Refrigerate until service. Using a blender, combine the first 9 ingredients. While the blender is running, slowly add the oil. Blend to a slightly thick consistency. Cooking with Infrared burner is like using a grill burner on steroids. Some restaurants have gas grills with 100,000 btu or wood grills that heat over 700˚f. If the average home cook had something this hot, the fire department would be making frequent stops at their home. Also, most of cooking would resemble the bottom of your shoe. Grills that offer a Infrared burner, provide a heat that is close to what the professionals use without the need of that extra fire extinguisher (although it does make sense to have one in your home for safety). 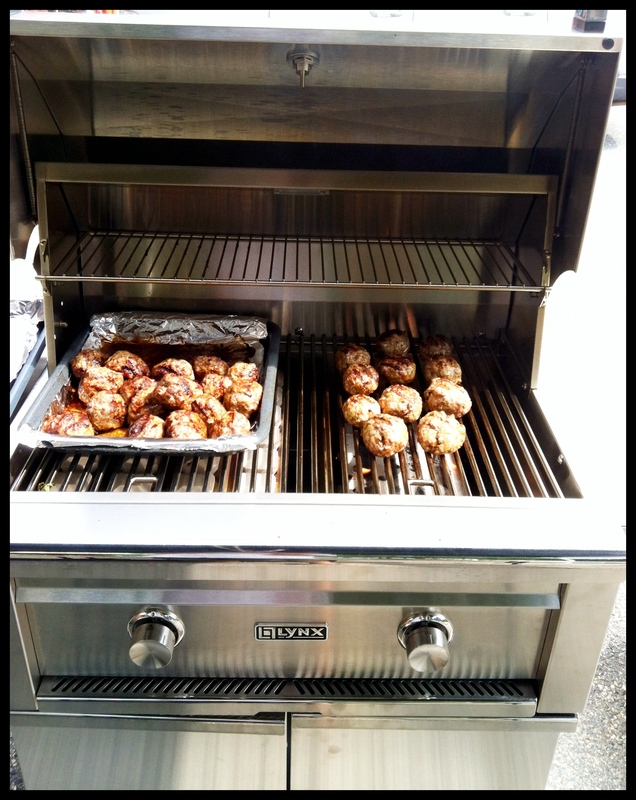 I recently cooked sliders on a Lynx Grill. Since sliders are small I could cook them start to finish over the Infrared Burner. You can cook thinner and smaller cuts over the Infrared burner. Most items should be just ‘seared’ over the Infrared burner and then finished over a standard burner to cook through. In a stainless steel bowl combine the first 10 ingredients. Form golf ball size meatballs. Turn on your grill. Set the Infrared Burner on high and place the lid down. Let the great heat for at least 8 minutes to get the grates hot. Raise lid and clean the grates with a grill brush. Spray the meatballs with cooking spray. Carefully & quickly place them on the hot grate with space in between. Let them cook for 2 1/2 minutes or until they will pull away from the grates without sticking. As you turn the over, place them on a clean grate or not over the same spot that they were cooking on. This keeps them from sticking to the remnants on the grates. Turn the heat down to low. Allow them to cook for another 4 minutes. Remove and place on a pan or platter to rest while they continue to cook. Serve on a fresh roll with your favorite condiments. Great opportunity to break out that ice cream machine that has been sitting in the box since last summer. 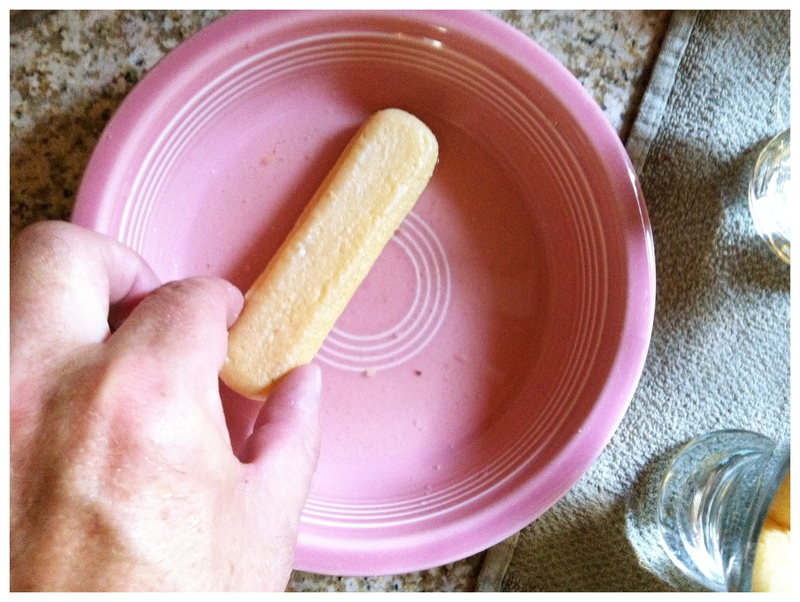 Or perhaps fill up some popsicle forms for a great treat on the go! In a sauce pan,combine 3/4 cup of water with sugar and place over a high heat. Boil to reduce liquid in half. Take pan from stove top and let simple syrup cool. Light chop the mint and combine with juices & remaining water, in a stainless steel bowl. 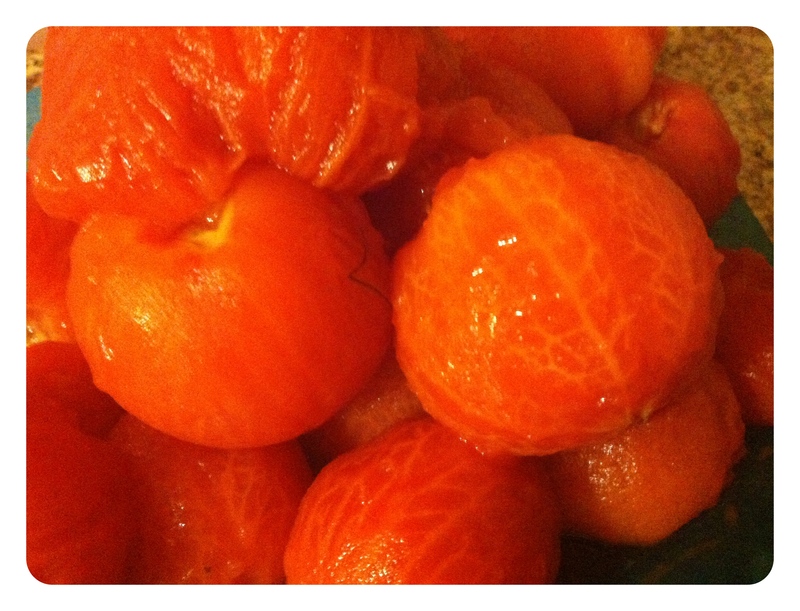 Mix in the simple syrup and place bowl, covered, in the refrigerator for a few hours. 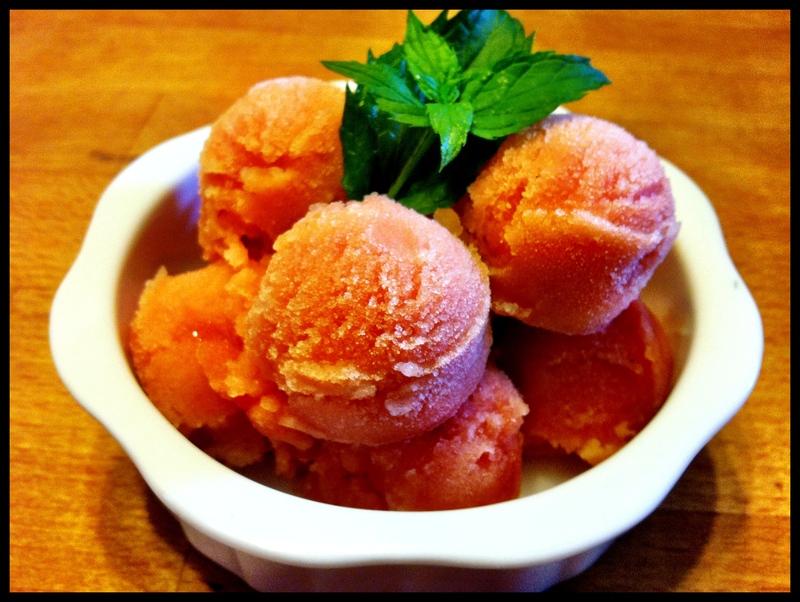 Strain the liquid and discard the mint before freezing your sorbet or pouring into popsicle molds. Set into ice cream maker and follow manufacturers instructions. Freeze it, share it or eat it. Kick up the recipe by adding 2 shots of light rum or a dash of both cinnamon and cayenne pepper. Okay Vegetarians and those of the gluten free preference, break out that mandoline that is sitting in the back of the cupboard and get ready for a great dinner and no scarred knuckles. Okay admittedly I have the pro version but the inexpensive plastic one works just fine. 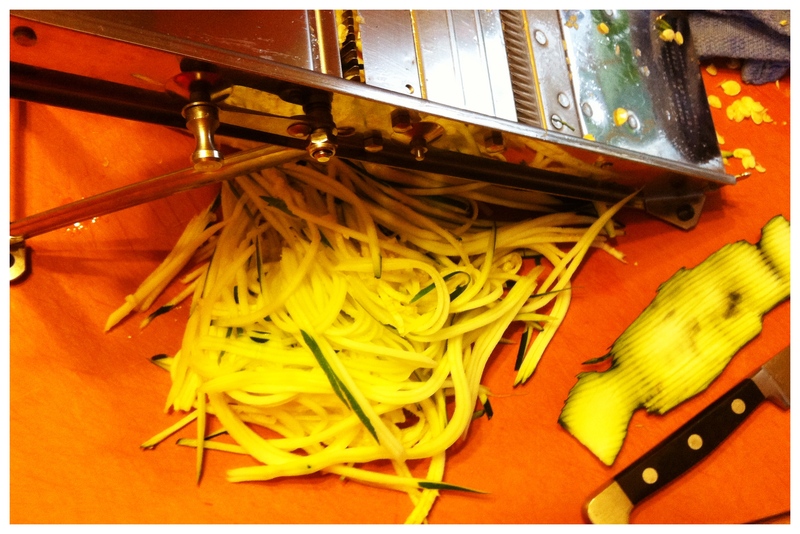 Set the cutter in the julienne setting. 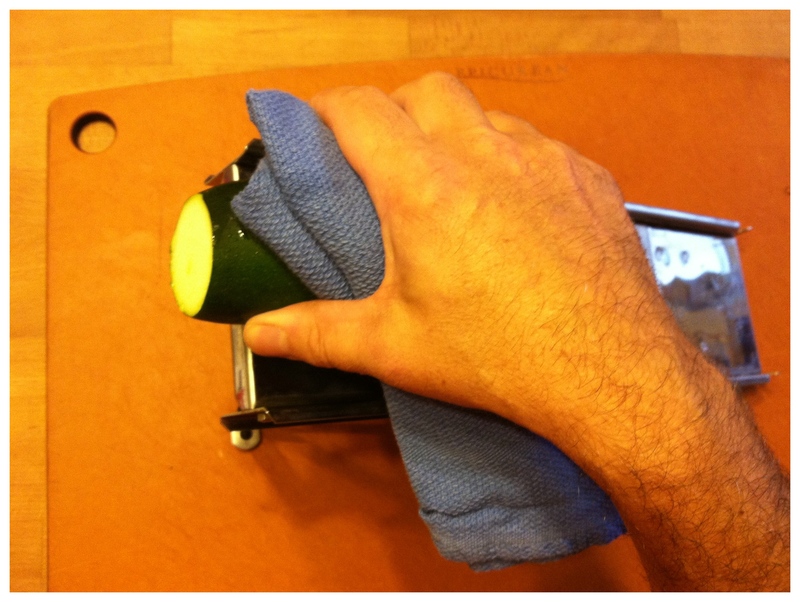 Use a towel to hold down the zucchini. You want to cut this lengthwise to get the spaghetti pasta effect. The cutter guard is too small for that. Set a large Saute pan on a high heat. Add the mushrooms and cook for 3-5 minutes to extract some moisture, then remove from pan set aside on a plate. Return pan to stove top over a high heat. After 1 minute add the oil and turn pan to coat. Add the Zucchini and cook occasionally stirring just to the point of light brown. Add the cherry tomatoes and garlic. 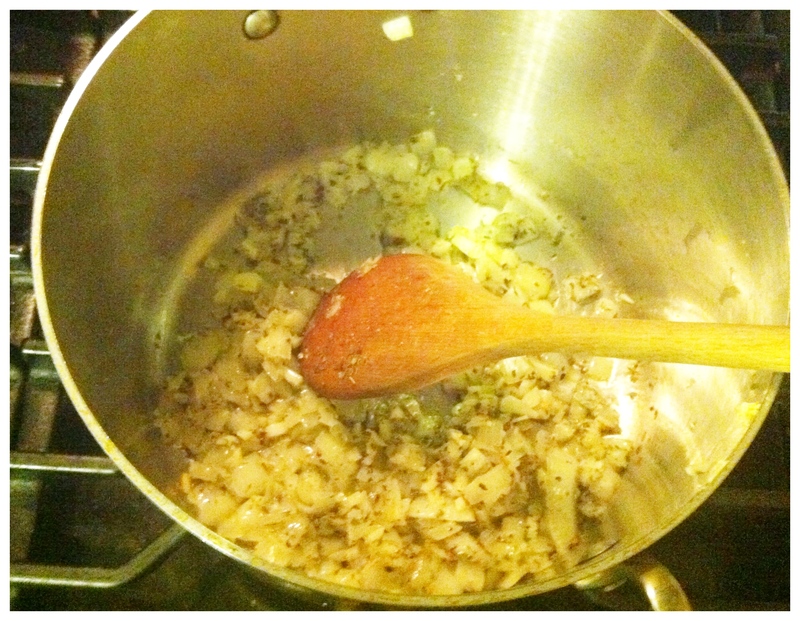 Carefully stir then add the lemon juice and mushrooms. 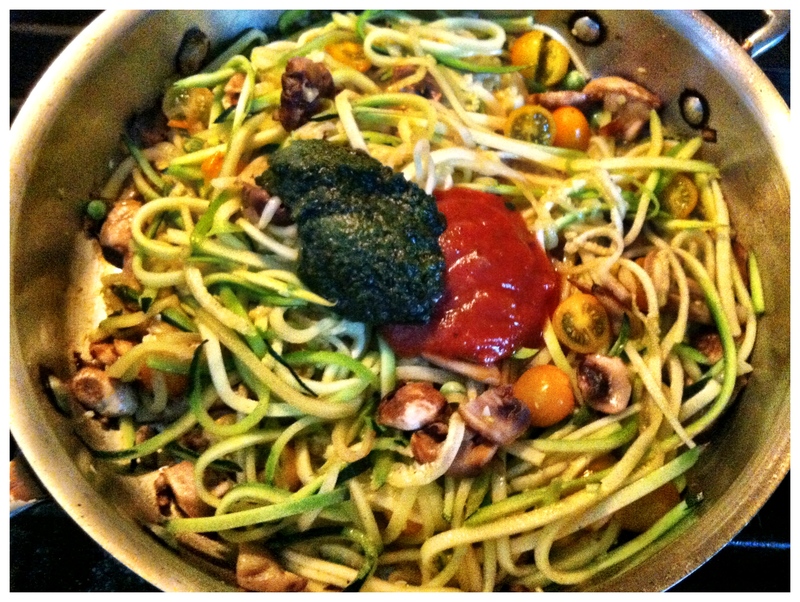 Let the veggies absorb the juice for a minute then add the pesto, tomato sauce & 1/2 cup of liquid. Season with S & P and carefully stir to combine. 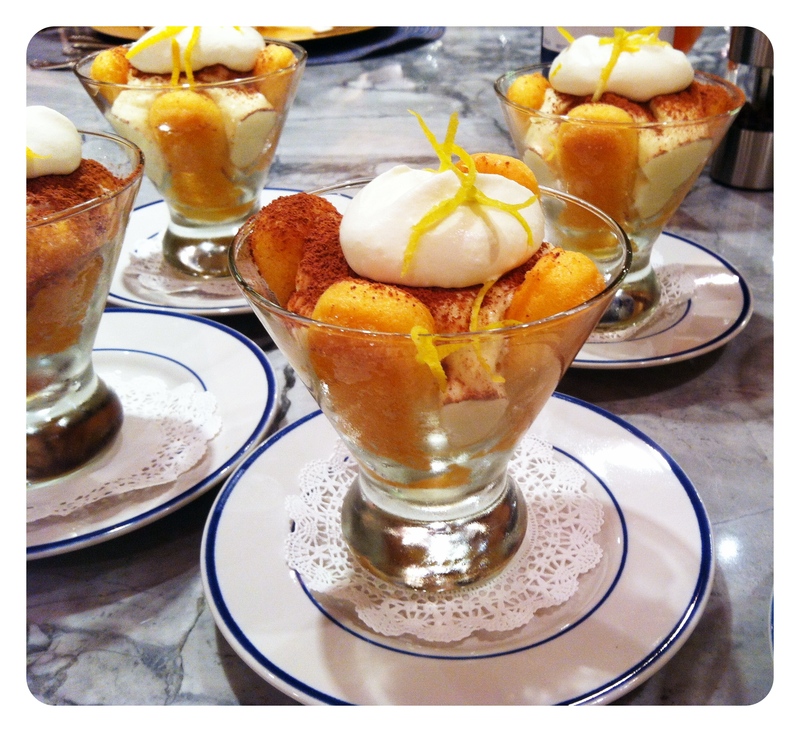 Nice cool dessert for the summer. I used stemless martini glasses for individual servings. The recipe can also be prepared in a trifle bowl or casserole. 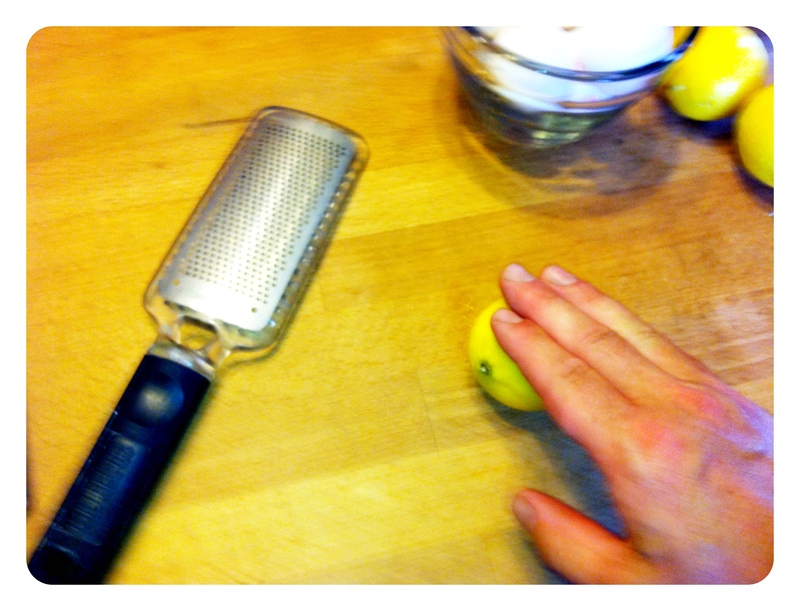 Press the lemons onto a cutting board and slowly roll with your fingers. This will help extract more juice. In a saucepan, mix Limoncello, juice from 2 lemons, 2 T sugar and water bring to a boil. Stir to dissolve the sugar then pour into a bowl and chill in refrigerator for at least 30 minutes. In an electric mixer with whip attachment combine egg yolks, 1/2 cup sugar & lemon zest from 1 lemon, beat on high until fluffy. Slowly add 1 cup heavy cream and Mascarpone and mix to smooth consistency then transfer to a larger ss bowl. Clean & dry mixer bowl and return it to mixer. Add egg whites beat to light peaks. Fold into egg Mascarpone mixture and chill. Break a couple of lady fingers to 1” cubes and place into bottom of martini glass. 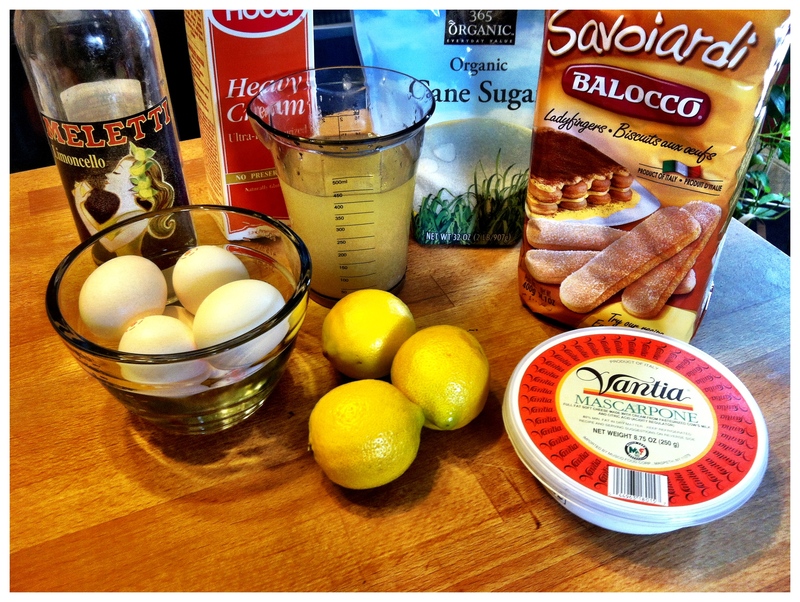 Place some of the Limoncello syrup into a shallow bowl or plate. 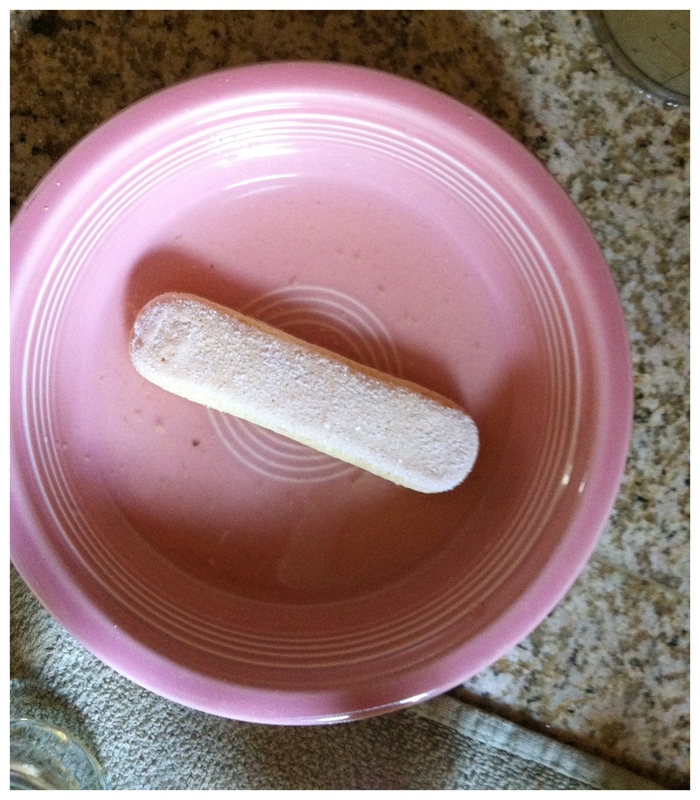 Dip full size lady fingers in quickly & place into the martini glasses. Use three per glass or break two in half and use four halves per glass. Scoop Mascarpone mixture on top. Chill before service. 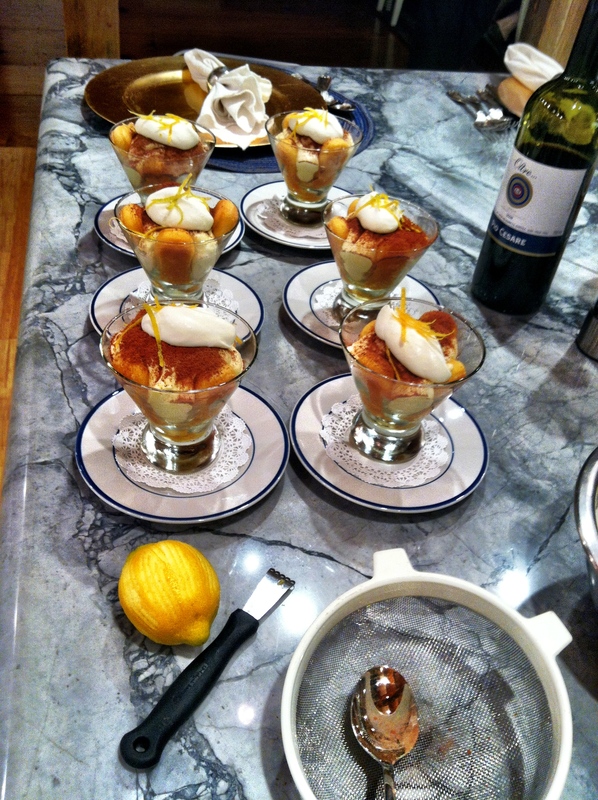 Drizzle remaining Limoncello syrup over desserts (1/2 teaspoon on each). In a small ss bowl whip remaining 2/3 cup heavy cream. 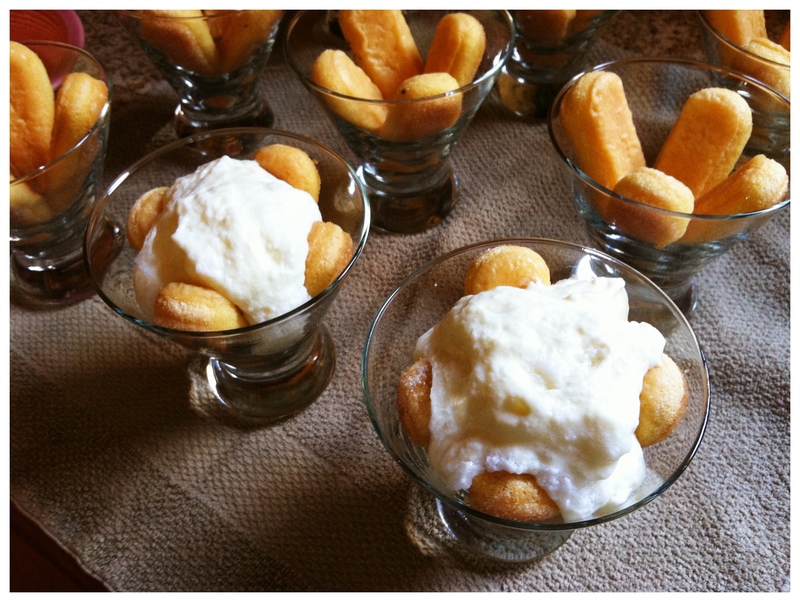 Place a dollop on top of each serving. Dust with cocoa powder and garnish with lemon zest or grated rind. If you happen to live in a city condo or apartment you may not be able to use an outdoor grill. 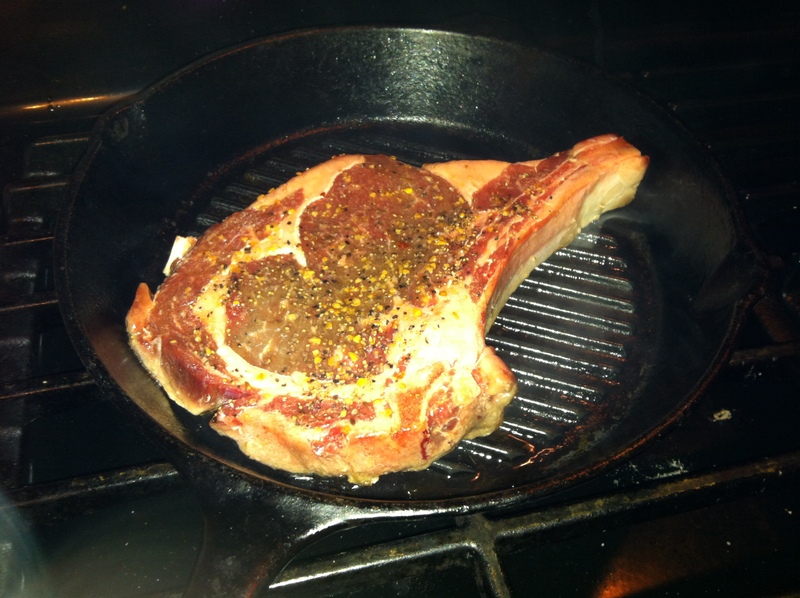 How can you cook Chops or Steaks with nice results? 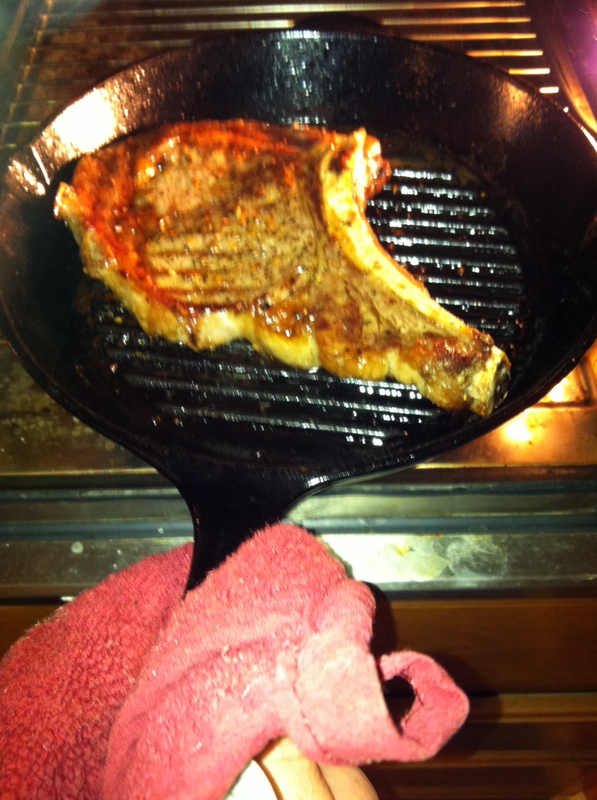 A skillet with the bottom grooves provides the grill marks, but the real benefit is that your chop or steak wont cook in the rendered grease becoming bitter. 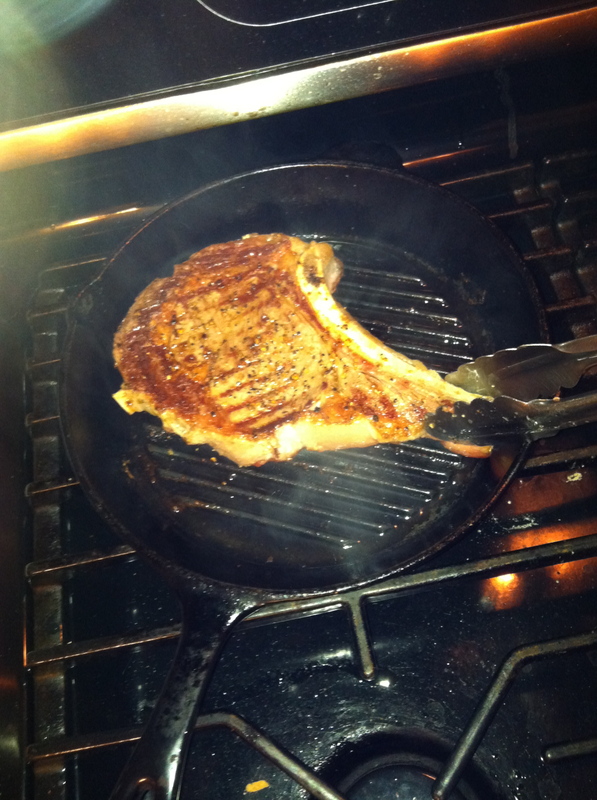 Those grate lines in the pan elevate it enough to keep it above the fat. Certainly fat is flavor, but when rendered from the steak or chop that you are cooking, it becomes grease that starts to burn and give off an undesirable flavor. Most pans are seasoned and can withstand a high heat. They are easy to clean if you wait until it slightly cools down, then add some warm water to it. This will allow any of the burnt on bits to come off easily without heavy scrubbing. Here is a good way of producing a good dinner. The first step is buying a good quality Steak or Chop. 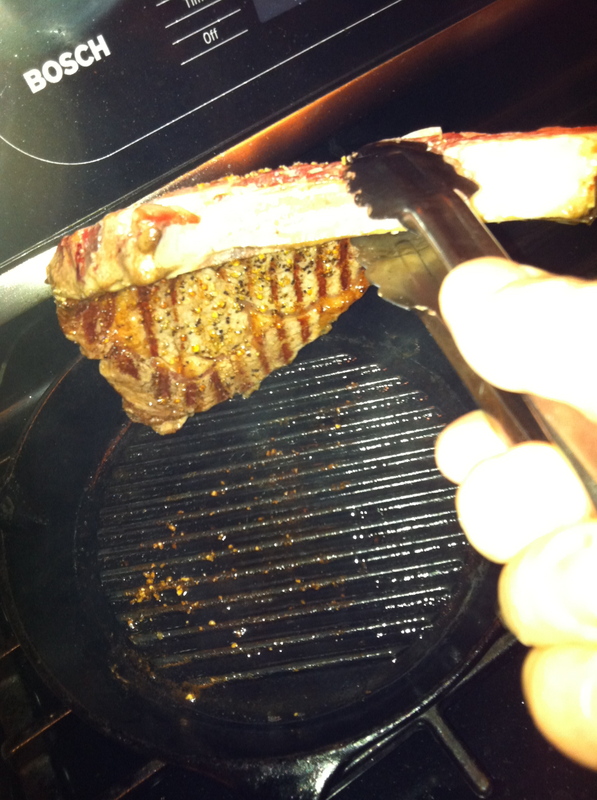 The Rib Chop is usually, ‘French Style’ in which the meat is cleaned from the bone. 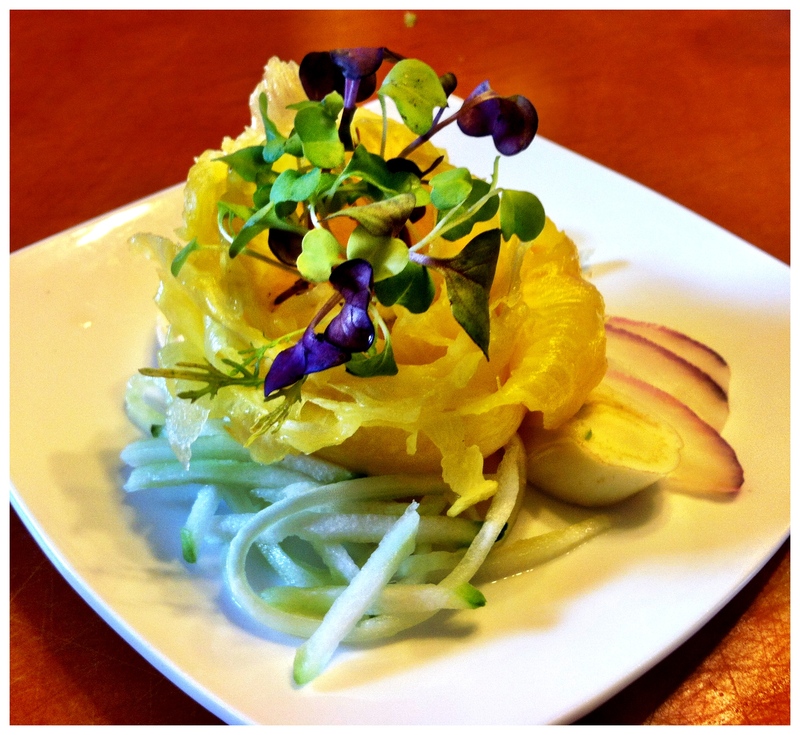 These can also be tied for even cooking and provide an excellent presentation. You can also pound this out with a meat mallet for quick cooking and a larger plate presentation. If it is good quality and not frozen, you won’t need much in the area of spices. You want to get the most flavor and just enhance it with a simple sauce. I use the following method for thicker steaks and chops. The photos are with a bone-in Rib Eye. We are using an oven as a finishing mode to speed up the cooking process and retain more juices and flavor. Kosher Salt and Cracked Black pepper. 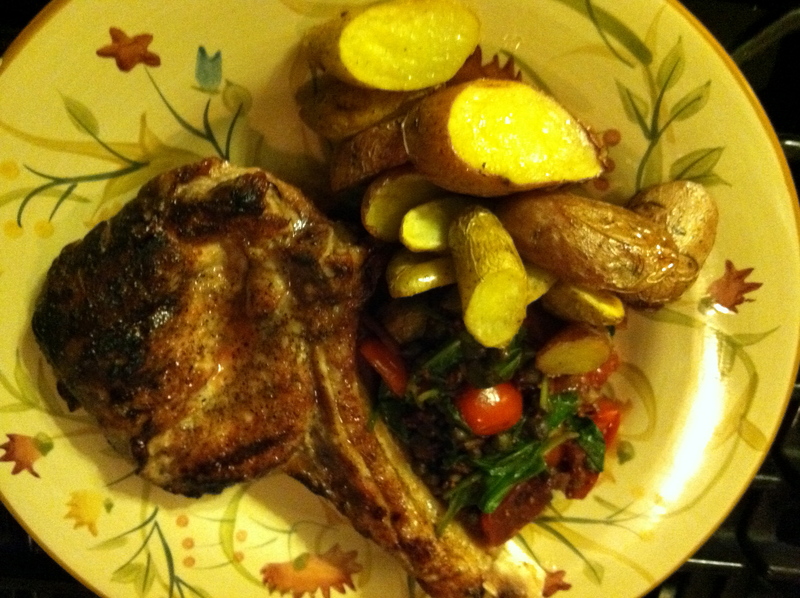 Whether you are cooking veal, beef, pork or lamb chops, the method remains the same. The only difference is the smaller chops may cook all the way through on the stove top based on your preferred doneness. Heat pan over a medium to high heat on the stove top. Season both sides of chop with a pinch of salt and some cracked pepper. Oil both sides of chop. As the pan begins to smoke add the chop. After about 2 minutes see if you can lift the chop and turn it to get the cross grill marks and continue to sear on the bottom side. If it is stuck to pan just wait a minute and it should come off easily. (this method works the same on your outdoor grill grates). Let it cook for about a minute then flip the chop over. After you flipped chop, top with butter and place into the oven on the middle rack. After 5 minutes begin checking for temperature. When cooked to your preference, remove from oven and plate the chop. Welcome. 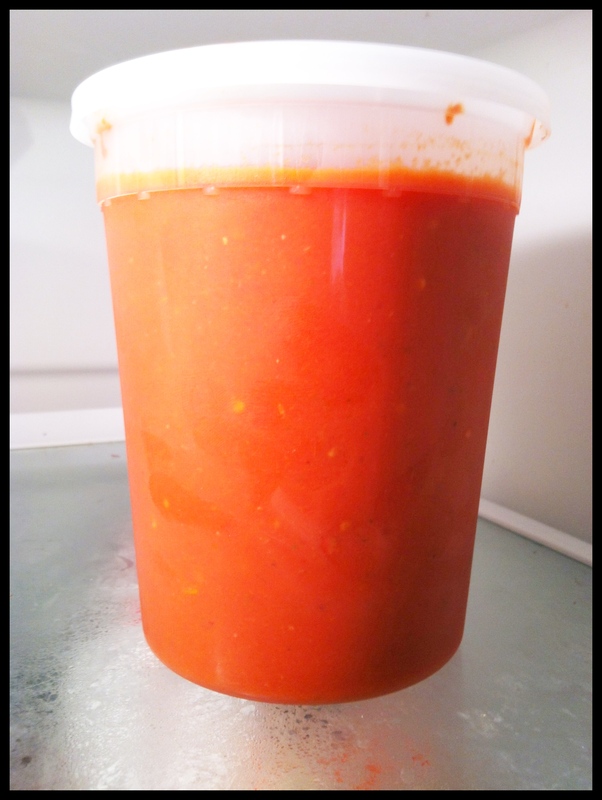 I test out kitchen appliances and share results and recipes. Thanks for checking out my blog.